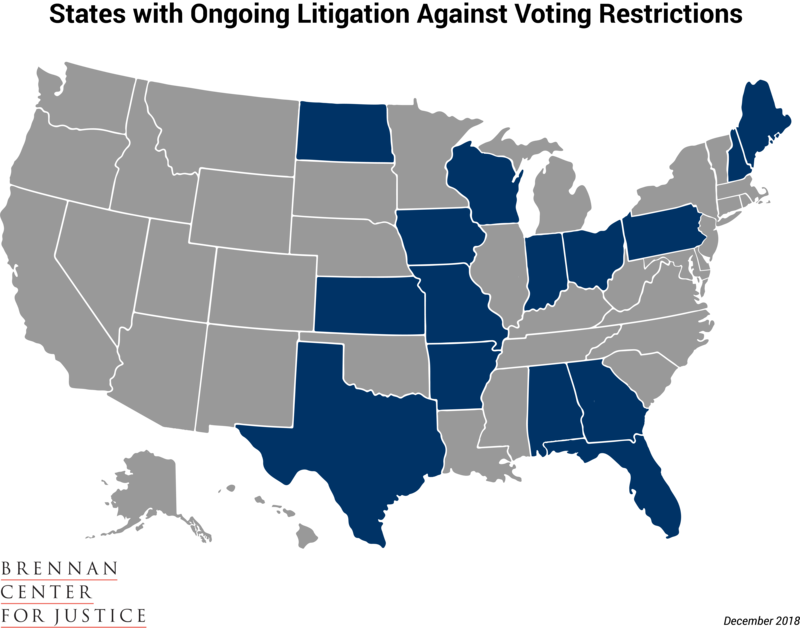 Here are the significant voting rights lawsuits in the states that we're keeping our eyes on. For additional context, click here to review our report on the State of Voting of 2018 and related update. On November 27, 2018, Fair Fight Action and Care in Action filed a lawsuit against the Georgia Secretary of State and the State Election Board. Plaintiffs allege that Defendants are responsible for a host of election related offenses, including failing to provide absentee ballots and improperly handling completed absentee ballots; failing to train local election officials; failing to properly maintain the voter registration list; improperly blocking registrations and purging voters; improperly preventing voters from using provisional ballots; improperly allowing long lines at polling locations; and failing to provide a sufficient number of paper ballots at polling places. Collectively, plaintiffs argue that these actions violate the First, Fourteenth, and Fifteenth Amendments of the U.S. Constitution, Section 2 of the Voting Rights Act, and the Help America Vote Act. On November 13, 2018, Bruce Poliquin, the Republican nominee for Maine’s 2nd Congressional District, and three Maine voters filed a lawsuit against Matthew Dunlap, the Maine Secretary of State, seeking to enjoin the state from using ranked choice voting (also known as “instant-runoff voting”) to determine the winner of the congressional election. Under Maine’s ranked choice voting system, voters are permitted to rank the candidates up for election, instead of voting for only one candidate. If no candidate wins an outright majority of votes, then the election goes into an “instant runoff”: lower-ranked candidates are eliminated from contention and their votes are redistributed to higher-ranked candidates, until a winner obtains a majority of votes. Plaintiffs claim that this system violates the Voting Rights Act, Article I, Section 2 of the U.S. Constitution, and the First and Fourteenth Amendments. On December 13, 2018, a federal district court denied Plaintiffs’ motion for a preliminary injunction and entered final judgment for the state, dismissing the case.